Caroline Ikoba (pictured left), lives in Omolokonyo, Kumi District in Uganda. Caroline was selected to become a Village Health Team member 15 years ago, when local council staff announced that they were looking for hardworking and faithful members to be trained as Village Health Team members. 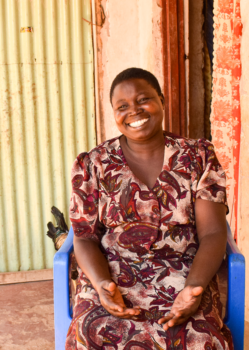 Since then, Caroline has been training and counseling women and men of the community about various health issues and family planning services. Caroline is well-known in her community and has had many positive impacts on families. Her favorite story is about a woman who, thanks to using family planning methods, is able to participate in the community life again. Previously, she had to stay at home to tend to her children who were still breastfeeding at the time. She now has time to go out to meetings and celebrations as her children are spaced out with more time between births. She and her husband have been much happier since they started using long-term family planning methods. As more and more families are interested in family planning, the demand for long-term methods and for Village Health Team members that are trained in this subject is constantly increasing. Caroline wishes that more people in her community could be trained in family planning. Aside from the health team members, hospitals also offer long-term family planning methods. Unfortunately, they are located far away from the villages, too far for most people. 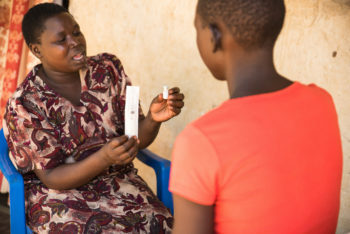 Another challenge Caroline faces with some community members is a lack of knowledge about family planning which often results in negative attitudes from husbands towards family planning methods. Therefore, Caroline makes sure to explain the advantages of family planning to both men and women. When she was little, Caroline wanted to be a teacher, but after working as a Village Health Team member for so long, she would now like to use her skills and become a nurse.